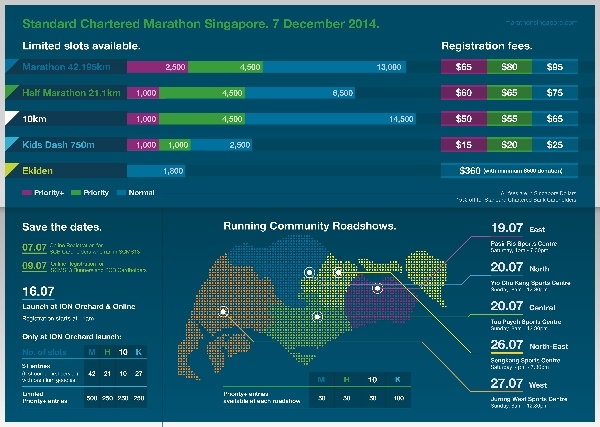 Participants in the Standard Chartered Marathon Singapore (SCMS) 2014 will enjoy more than 20,000 discounted race entries, including 100 special $1 slots across the range of race categories, when registration opens next month. 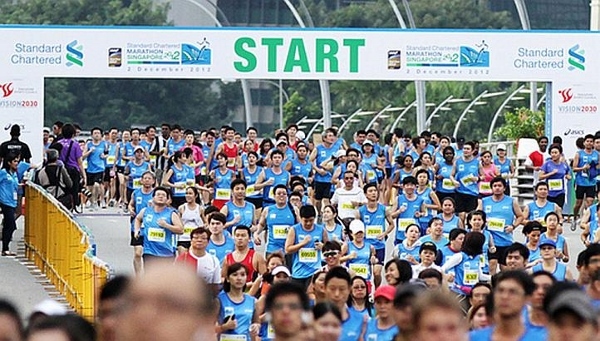 Event organiser Spectrum Worldwide also confirmed that there will be no increase in fees this year as they unveiled a new registration model for Singapore’s marquee running event. Moving away from the traditional time-based ‘Early Bird’ structure, the new system is designed to reward participants who sign up early. 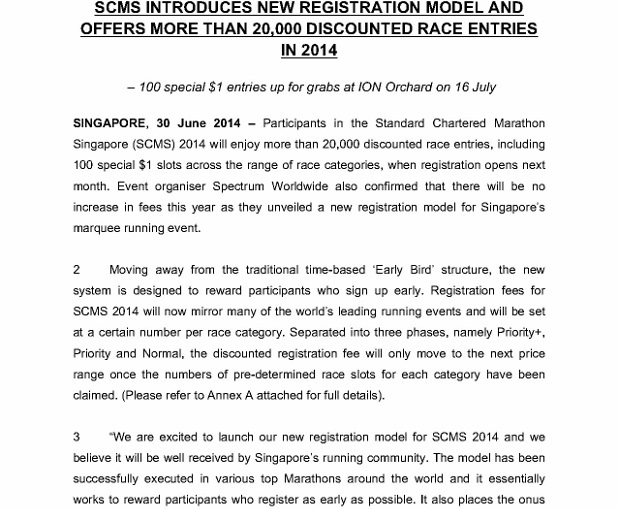 Registration fees for SCMS 2014 will now mirror many of the world’s leading running events and will be set at a certain number per race category. 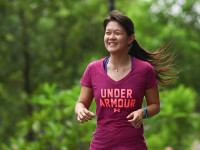 Separated into three phases, namely Priority+, Priority and Normal, the discounted registration fee will only move to the next price range once the numbers of pre-determined race slots for each category have been claimed. 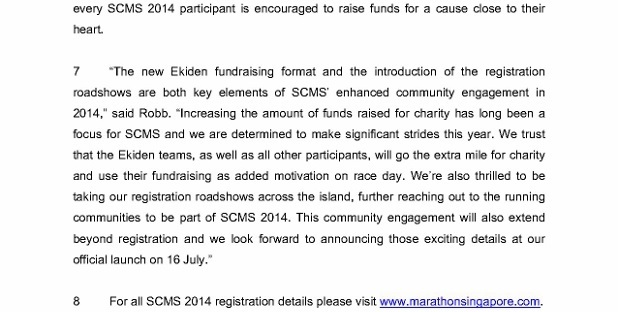 SCMS 2013 runners who are also SCB cardholders have the first opportunity for registration from 7 July 2014. 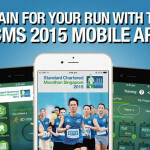 In addition, all SCMS 2013 runners and Standard Chartered Bank cardholders will be able to secure their spots on the start line from 9 July. This pre-launch registration period closes at 12.00am on 15 July until public registration officially opens from 11.00am on 16 July. 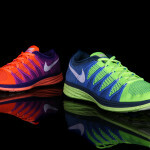 Participants can either sign up in person at ION Orchard during the launch event or online at www.marathonsingapore.com. 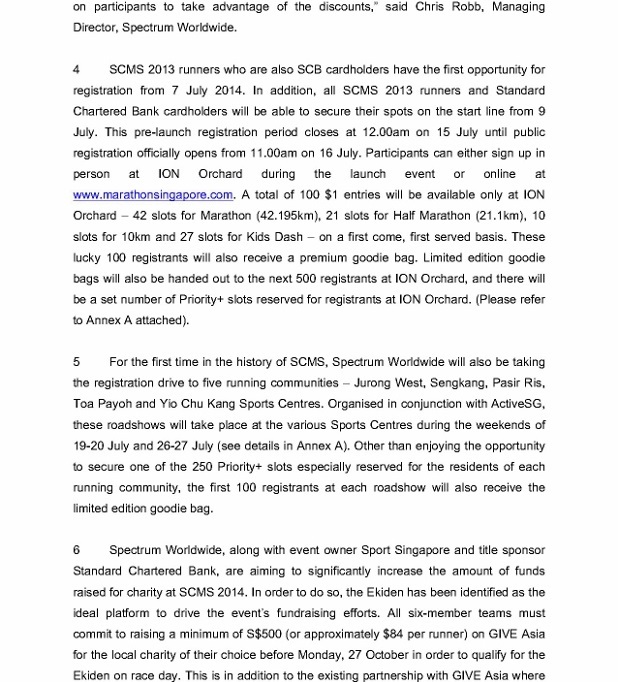 A total of 100 $1 entries will be available only at ION Orchard – 42 slots for Marathon (42.195km), 21 slots for Half Marathon (21.1km), 10 slots for 10km and 27 slots for Kids Dash – on a first come, first served basis. 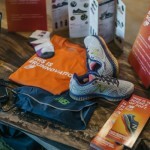 These lucky 100 registrants will also receive a premium goodie bag. 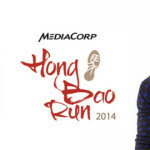 Limited edition goodie bags will also be handed out to the next 500 registrants at ION Orchard, and there will be a set number of Priority+ slots reserved for registrants at ION Orchard.